Can my concrete be saved? With obvious chips, deep pits and noticeable gaps, cracks and shifting, you might think your concrete isn’t worth saving. 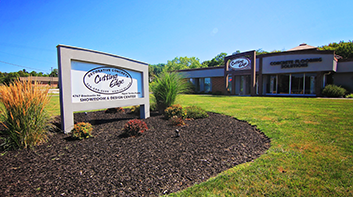 A company like Cutting Edge Decorative Concrete, with expert knowledge of the physical and chemical properties of concrete along with a strict adherence to using only the highest quality products available to the trade, can not only fix obvious signs of wear and tear, but also can make repairs to concrete that will make it look like new again. A driveway that has been heavily damaged by age and salt corrosion can be treated to a thin coating of concrete, or concrete overlay, to correct any surface defects and make the concrete appear to have been freshly poured. You can even have your concrete overlay stamped or colored for a high-end look. Significant cracking and other damage is repaired prior to the application of a concrete overlay. Many people are surprised to learn that a concrete overlay can be as thin as 1/8 of an inch, or as thick as 3/8. And compared to the cost of a new driveway, you can expect to pocket a savings of up to half the cost. Combine that savings with virtually no disturbance to your yard, no dirt and only a minimal intrusion on your daily life, and the advantages of a concrete overlay become abundantly clear. But concrete overlays aren’t limited to the driveway alone. Cutting Edge Decorative Concrete can return a basement floor to that just-poured look it sported when your home was initially constructed. We can even cover over existing asbestos tile so you don’t have to pay for a costly abatement. From there you can either leave the concrete overlay as is, or opt to add color or a coating. Cutting Edge’s epoxy coatings are ideal for transforming basement and garage floors into attractive, finished surfaces.